[Evangelicals give] the impression that religious work is more God-pleasing than other tasks and duties associated with life in the world. According to this mindset, the believer who makes an evangelism call, serves on a congregational committee, or reads a lesson in the church service is performing more spiritually significant work than the Christian mother who tends to her children or the Christian who works with integrity in a factory. Author and college professor Gene Veith agrees. The word vocation can still be heard sometimes, but the concept is generally misunderstood or incompletely understood. The doctrine of vocation is not “occupationalism,” a particular focus upon one’s job. The term means “calling,” but it does not have to do with God’s voice summoning you to do a great work for him. It does not mean serving God by evangelizing on the job. Nor does the doctrine of vocation mean that everyone is a minister, though it is about the priesthood of all believers. It does not even mean doing everything for God’s glory, or doing our very best as a way to glorify God, though it is about God’s glory, at the expense of our own. Dr. Gene Veith is one of several individuals currently contributing to a renewed interest in this important doctrine. In a short article in Modern Reformation, “Our Calling and God’s Glory,” he has given us a very helpful primer on vocation. To understand fully the doctrine of vocation, one should begin not with the Puritans—who tended to turn the doctrine of vocation into a work ethic—but with Luther and with Lutherans, from the composers of the Book of Concord to modern theologians such as [Einar] Billing and Gustaf Wingren. It goes something like this: When we pray the Lord’s Prayer, we ask God to give us this day our daily bread. And he does. The way he gives us our daily bread is through the vocations of farmers, millers, and bakers. We might add truck drivers, factory workers, bankers, warehouse attendants, and the lady at the checkout counter. Virtually every step of our whole economic system contributes to that piece of toast you had for breakfast. And when you thanked God for the food that he provided, you were right to do so. God could have chosen to create new human beings to populate the earth out of the dust, as he did with the first man. But instead, he chose to create new life—which, however commonplace, is no less miraculous—by means of mothers and fathers, wives and husbands, the vocations of the family. God protects us through the vocations of earthly government, as detailed in Romans 13. He gives his gifts of healing usually not through out-and-out miracles (though he can) but by means of the medical vocations. He proclaims his word by means of human pastors. He teaches by means of teachers. He creates works of beauty and meaning by means of human artists, whom he has given particular talents. Many treatments of the doctrine of vocation emphasize what we do, or are supposed to do, in our various callings. This is part of it, as are the various aspects that I outlined above, but it is essential in grasping the magnitude of this teaching to understand first the sense in which vocation is God’s work. God is milking the cows through the vocation of the milkmaid, said Luther. According to Luther, vocation is a “mask of God.” He is hidden in vocation. We see the milkmaid, or the farmer, or the doctor or pastor or artist. But, looming behind this human mask, God is genuinely present and active in what they do for us. For a Christian, conscious of vocation as the mask of God, all of life, even the most mundane facets of our existence, become occasions to glorify God. Whenever someone does something for you—brings your meal at a restaurant, cleans up after you, builds your house, preaches a sermon—be grateful for the human beings whom God is using to bless you and praise him for his unmerited gifts. Do you savor your food? Glorify God for the hands that prepared it. Are you moved by a work of art—a piece of music, a novel, a movie? Glorify God who has given such artistic gifts to human beings. 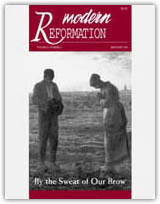 “Our Calling and God’s Glory” and “The Doctrine of Vocation: How God Hides Himself in Human Work” were both published in Modern Reformation. Dr. Veith’s book, God at Work: Your Christian Vocation in All of Life, is available here. Chapters 1 and 2 are available from the publisher, Crossway (scroll down to mid-page).